Get ready for one of the most-extreme rafting trips in Costa Rica! You will love the adrenaline-charged and intense Sarapiquí River class 3-4 Jungle Run section. Desafio has an exclusive entrance to the most-exciting part of this exuberant river! Rafting on the Sarapiquí River is considered one of the "Must-Do" Costa Rica tours near the Arenal Volcano. 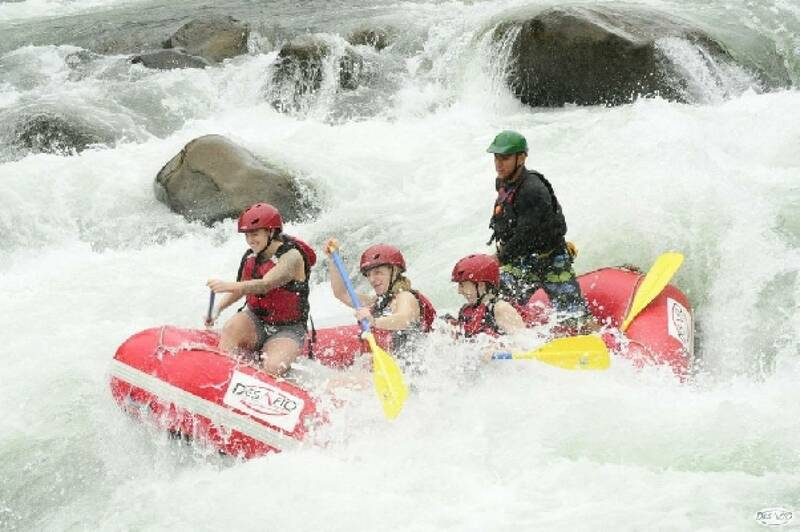 Bring on the adrenaline on the class 3-4 rafting trip on the Sarapiquí "Jungle Run!" This is the perfect rafting trip for adventurous paddlers! Whether you are a first-timer or a rafting expert, this rafting trip will guarantee to get your adrenaline pumping! You'll experience over 30 continuous rapids with names like "The Terminator" and "Dos Locos" while surrounded by deep, lush jungle. That's why we call it the Jungle Run! One of our friendly professional river guides will come by your hotel to pick you up. You will then travel through small Costa Rican villages to the quaint town of San Miguel de Sarapiquí. There, your rafting guides will give you the 101 on rafting including safety tips and technical instructions before heading on your 2 hour journey down one of Costa Rica’s most exuberant rivers! We will get you fitted with your top-quality rafting gear such as an NRS helmet, lifejacket, and paddle.You will then be divided into groups of 4 or 5 paddlers -- we use high-quality 13-ft rafts that seat up to 5 people plus your guide in the back. Your professional guide will provide paddling and safety instructions to prepare you for your adventure! During your descent down the river, you will experience over 40 exciting rapids along 12 km of lush, vibrant rainforest. As you make your way through exciting rapids, we’ll be sure to get your adrenaline pumping! About half way down the river, you’ll stop and watch the rapids from the shore, while enjoying refreshing tropical fruit and relaxing with the rest of the group. Take a swim and enjoy the rushing waters around you! Then, after the second leg of your rafting journey, you’ll finish the day with a delicious traditional lunch before heading back to your hotel.